For many consumers, the first time they'll see your product is when they receive a package in the mail. This is a great opportunity to take your packaging to a new level that will both engage and impress your customers. Creating an unboxing experience that does both is a chance to retain loyal customers and create new ones. As online shopping becomes more popular, it's important to ensure your packaging leaves a good first impression. While product protection plays a big role in packaging, the unboxing experience is becoming more and more important to your business. Optimizing your packaging for this experience will leave your customers with a lasting first impression. Unboxing videos are really popular. That’s not an opinion, it’s fact. Dotcom Distribution recently conducted a survey of 600 online shoppers to understand their attitudes towards packaging, shipping, and the online shopping experience. 36.8% of respondents said they’d seen an unboxing video. A great unboxing video gives shoppers a chance to not only see the quality of a product before purchasing and helps consumers determine if the product is worth the purchase. Using your packaging as a branding and marketing tool is becoming increasingly important. It goes beyond simply making your box look cool. If you’re not sure about how to get started with designing your packaging, it’s easy to play around with the online design tools at Packlane to see how your boxes would look. You can even design just one box to get started. Packaging design is critical because this is the first time many consumers will see your product. Even the way your packaging feels (or smells!) can leave an impression. Maintaining a good relationship with consumers through social media can go a long way in fostering your brand’s online reputation. Use the unboxing experience as a marketing tool to encourage customers to document their experience on social media. Drive engagement to your brand’s social media channels by having consumers use branded hashtags when they post photos and videos of them unboxing your product. Knowing your audience will help guide many of the decisions you’ll need to make when it comes time to send your packaging. While the unboxing experience is great for your customers, it’s also a critical sales tool that will drive more sales to your business. First up, you’ll need to decide who your packaging is for. This will ultimately help you decide what goes inside the box and how to design it. Is this a first time customer, a repeat customer or even an influencer? Educating your customers about your product is important and shouldn’t be overlooked. If your product requires specific instructions on use or maintenance, it’s good to include some form of instructions either separately or as part of the packaging itself. For first time customers, focus on creating an amazing design that sets your brand and product apart from your competition. Include text directly on your box that welcomes them for their first time purchase. This is a great way to acknowledge their business and thank them for purchasing. For loyal customers, include an extra thank you to show them their business is valued. It can be as simple as a card or discount but being recognized for their loyalty is a powerful way to connect with them. You may not be sending your box to a customer at all. You may be sending to influencers who will document every aspect of the unboxing experience on social media. They have a large audience you want to connect with and it’s important to know how to reach them. With influencers, it helps to know more about their likes and dislikes. Watch some of their previous unboxing videos to see what they struggle with, what they hate, and what makes them squeal with delight. It will not only teach you how to create a better experience for your customers but it will also help create an experience the influencer will rave about. Make customers feel like insiders who have intimate knowledge of what goes on behind the scenes of your company. This will not only build brand loyalty but help you tell your story which is a key element of connecting with customers. How many times have you read a story about how a product was developed through a happy accident? These types of stories are interesting because they connect with consumers on a personal level. The best way to tell a story through the unboxing experience is to tell your customers how your product will change their lives. This will help them understand your product’s potential and its benefits. Reiterating your product’s benefits will always help remind your customers why they purchased from you in the first place. The one thing that each step has in common is “the box”. Creating your custom box is extremely fun and a great way to set the tone for what’s to come inside. The type of box you’ll need will be determined by the size of your product and how much protection you want to provide. The two main types of boxes used by most e-commerce businesses are mailer boxes and shipping boxes. Both mailer boxes and shipping boxes are excellent choices because you can place your item directly in the mail and send them to your customer. They provide very good protection when shipped and have the added bonus of displaying your custom designed packaging. Mailer boxes are versatile and stylish. They are commonly used for subscription boxes and are easy to open. They are an excellent choice for shipping directly to your customers without having use external packaging. They are extremely sturdy and provide good product protection while in transit. Mailer boxes are shipped flat and easy to assemble. How to assemble a mailer box from packlane on Vimeo. Shipping boxes are strong and more secure and will provide your products with more protection. They are the most common type of box used for online purchases. As with mailer boxes, shipping boxes are an excellent choice for shipping directly to your customers without having to use external packaging. They have the advantage of being more durable in transit and are less expensive than mailer boxes. Packlane also offers folding cartons but these are not ideal if you’re looking to ship directly to customers. Folding cartons are excellent to display items and are often used for internal packaging. They don't provide the necessary protection when shipping so it's a good idea to place them in an external box to keep them from getting damaged in transit. There are many different types of materials to consider as filler. What’s inside the box matters not only in terms of the product but what is used to protect the product. Don’t place a small item inside a large box with extra filler. This can leave a negative impression with your customers who may see this as wasteful. Make sure you use just enough filler to protect your product without going overboard. You don’t want your customers to share their unboxing experience for the wrong reasons. Sending your customers a beautifully designed box will show them your product is a premium item so make your packaging amazing. Packlane has made it super easy for anyone to design and edit their custom packaging using their online box designer. To get started, you'll need to choose a size, material, and quantity. You’ll be able to see instant quoting as you add elements to your design. From here, you can design either the exterior or interior of your box (or both!). Then simply choose the side of the box you'd like to design and start creating your masterpiece. You can upload vector and high-resolution artwork in several formats to any side of your box. You can also add text to your design and adjust your color. When you're done, save your design (you'll need to be logged in to do so). You can then share your design with friends and colleagues before continuing to place your order at checkout. If you have more specific questions about what artwork looks best, check out the Artwork FAQ section at Packlane. Take advantage of the space in the box. Why waste the opportunity to share your logo in your design? This will not only help market your brand, it also reminds customers where they ordered from. Using patterns with fun characters and icons can hint at what’s inside the box and help build the excitement and expectation of what’s inside the box. Orient - A Chinoiserie story! Remind your customers to share their experience on social media by including any branded hashtags you may want them to use. It’s also a good idea to share your social media URLs on your box. Design 101, your design should match the tone of your brand and be a reflection of your brand. If your branding is simple, keep your design minimal. If your brand is fun and all about personality, add bright colors and patterns to reflect what you’re about. If your product is high-end, you’ll want to ensure your design is elegant. 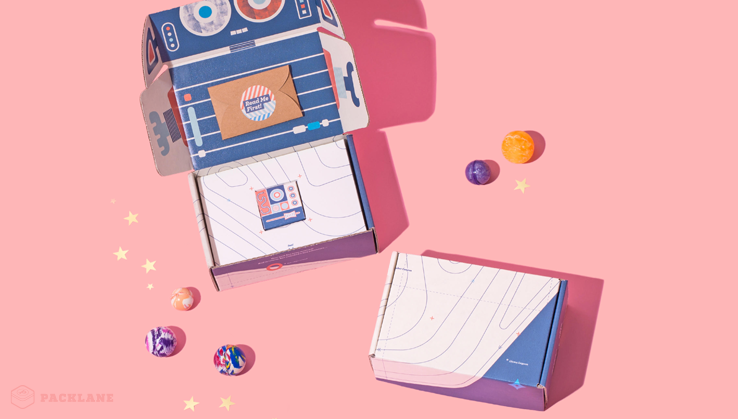 Connect with your customers by putting inside jokes on your box or include Easter Eggs that may be hidden in your design. This will connect with your customers and when they share on social media can create a sense of community that they belong to the “cool” kids club. Give your packaging personality. Your business is run by real people who work hard to make sure customers are taken care of. Take advantage of every opportunity to connect with your customers on a personal level. Include a place in the box design where the person who packaged the product can sign their name and leave a small note saying thanks for ordering with us. Tell people what to do next. If you hope that customers will send your product as a gift to their friends, say it outright. “Give a gift to a friend,” is a direct way to tell customers exactly what you want them to do. When designing your box, factor in your packaging budget. If you’re trying to keep your budget minimal, go for a design that doesn’t require a lot of ink coverage on the box. Think about interior printing as well. This is a great opportunity to give your customers more to think about but it will also increase your budget. When using interior printing, think of it as creating a personal touch. What’s in the box is probably what matters most to your customers. It’s why they ordered from you and why you want to make sure they return for repeat business. Simply placing your product in a box and sealing it up isn’t going to cut it. Give them something to remember. Everyone loves opening gifts so make your packaging feel like your customer is opening a gift. Personalize the experience by including a handwritten note thanking them for their business. Depending on the size of your business, this may not always be possible. In that case, you could always include some form of discount to be applied to future purchases as a way of saying thank you. This is where you can be creative and think of a special discount code that would be relevant to their purchase. Who doesn’t love free stuff? Find a way to include a free bonus item in their order. It doesn’t have to be anything major. It can be as small as including a company sticker. Have you been in a Starbucks lately? Look at all the people using their laptops and you’ll be sure to see a lot of stickers giving companies all kinds of free advertising. Include small thank-you gifts in your packaging. It may be small but include trial sizes of your own products. Cosmetic companies frequently include small sample items when you purchase. It’s a great way to create repeat customers to make additional purchases. Think of ways to include items from small local businesses you support as a way to spread awareness and pay it forward. People will be impressed and want to tell their friends about the cool bonus stuff they received. Always give people a reason to talk about your brand and products. Incentivize sharing on social media. Create giveaways with branded hashtags so that when people share their unboxing experience on social media, they’ll be entered into a draw to win something. By encouraging people to share on social media, it reinforces their purchase. This is an opportunity to show off the new purchase they’ve made with their friends. In some cases, they’ll feel like an influencer who is helping to drive the purchasing trends of their friends. Think outside the box. When the unboxing experience is over, what happens to your box? Is it relegated to the recycling bin or repurposed for other uses? Many customers will reuse custom packaging to store items while others will give it to their cats to sleep in (seriously, look up cats in boxes on Instagram - you won’t be sorry). A great example of a company thinking outside the box is LootCrate, a monthly pop culture subscription box. They have encouraged their customers to repurpose their boxes in many different ways such as creating a magazine holder to store items shipped in their subscription box. What do you want your customers to feel when they unbox your product? What do you want them to know about your product or brand? The expectations of an unboxing experience exceed the desire for your customers to simply share a photo or video. They provide social proof to potential customers that your product is worth it. But don’t just settle on meeting expectations for potential customers. Show them what’s in it for them. This is a guest post by Packlane, a company that offers custom packaging for creatives and entrepreneurs. To see the different boxes available throughPacklane, order a sample kit to see what your custom creation can look like.